The diagnosis of pericardial syndromes, while occasionally straightforward, includes a wide range of pathologies and is often a well-recognized clinical challenge. 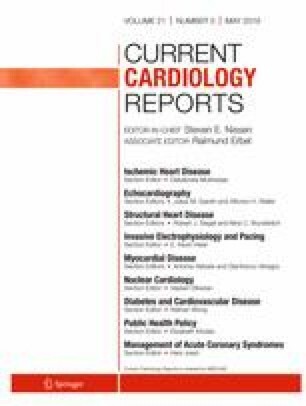 The aim of this review is to highlight the key role of the various imaging modalities for the diagnosis and management of the spectrum of pericardial diseases. Cardiac imaging has become an integral part of the diagnostic process often beginning with echocardiography and supported by advanced imaging modalities including computed tomography, magnetic resonance imaging, and positive emission tomography. These modalities go beyond the simple identification of the pericardium, to identifying increased pericardial thickness, active pericardial edema and inflammation, and its effect on cardiac hemodynamics. Multimodality imaging has significantly facilitated the diagnosis and long-term management of patients with pericardial diseases. The role of these imaging modalities in overall prognosis and prevention remains to be investigated. Michael Chetrit, Bo Xu, and Beni R. Verma declare that they have no conflict of interest. Allan L. Klein has received honoraria from Sobi and a research grant from Kiniksa.